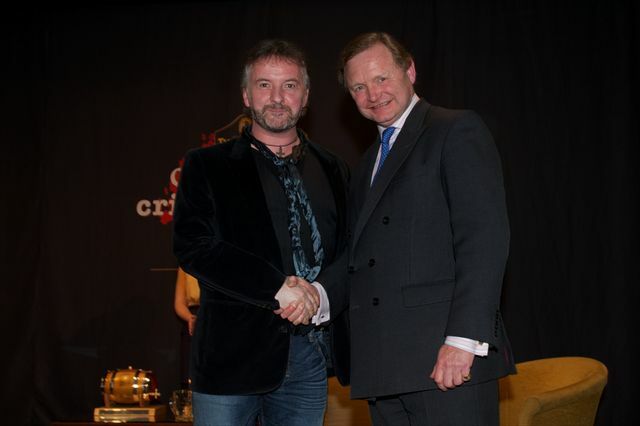 Launching at its customary 8pm on Thursday night slot, it was a packed house for the opening night of the 10th Anniversary of the biggest crime writing festival in Europe and the 2012 Crime Novel of the Year Award ceremony. 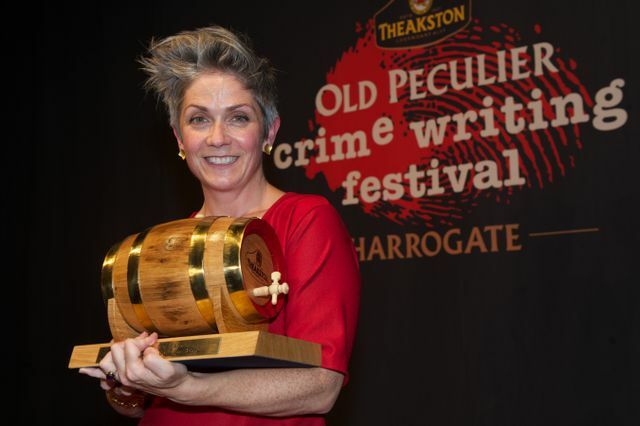 Opened by festival Chief Executive Sharon Canavar, this was a vintage year for the gathered crowd with a great final shortlist of six great crime books and their authors up for the prize – a really tough one to call. I felt especially pleased and sorry (in equal doses) for the team at Orion publishers who had two authors on the shortlist, so I’m sure there were some serious ups and downs during the evening for them. Simon Theakston, Executive Director at T&R Theakston, took to the stage to talk about the company’s proud and continued sponsorship with the festival and to make as many tenuous, and often humorous, links as he could to the brewery and its association with the world of crime writing. He closed by warning us that in the party bar after the awards the festival-only brew of ‘Crime of Passion’ would once again be available if we wanted to take our chances with a brew that had a distinct hint of almonds (or was that arsenic?) contained within. Top arts broadcaster Mark Lawson was back again this year to introduce each shortlisted author and their book to the stage (with the exception of Chris Brookmyre who, in true Oscars style was unable to attend as he was in Australia). Lawson began proceedings by saying that the security of the festival was being handled by G4S and that they had been under pressure to ensure that some Olympic-themed activities took place during the festival this year: This was to include such events as Beach Volleyball with ValMcDermid and Tania Carver! 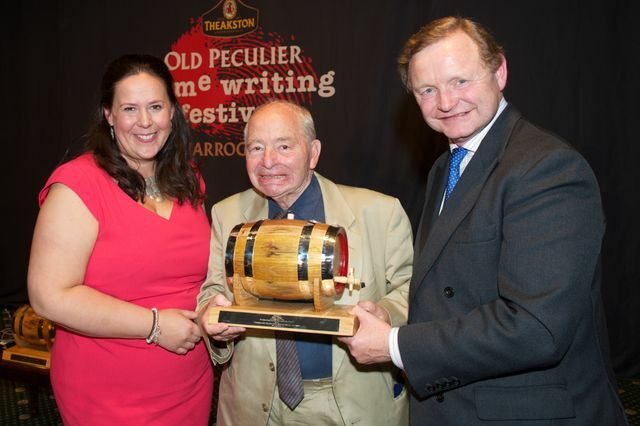 Lawson refused to let slip anything about the recipient of this year’s lifetime achievement award until it was time for that part of the show, saying he wouldn’t let anything slip in code, not even in Morse code….! 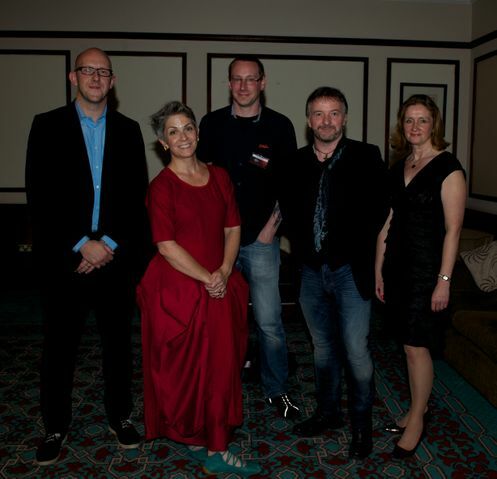 With Chris Brookmyre absent, his book: Where the Bodies Are Buried, was introduced by Lawson and his prize for being shortlisted was collected by his publishers, and then each author in turn came to the stage to collect their shortlist prize and to talk briefly about their novel. SJ Bolton for Now You See Me. John Connolly for The Burning Soul. Denise Mina for The End of the Wasp Season. Steve Mosby for Black Flowers. SJ Watson for Before I Go to Sleep. 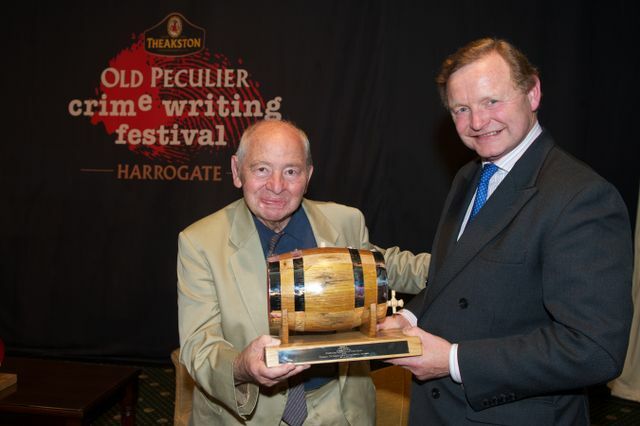 But, before it was time to announce the winner, it was time to unveil the winner of the lifetime achievement award and a swift standing ovation followed the news as Inspector Morse creator Colin Dexter took to the stage. 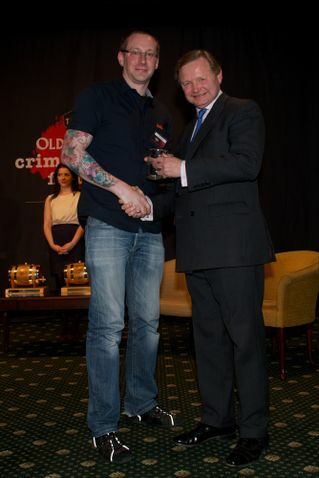 In scenes akin to seeing PD James collect her own award last year for the same, Dexter was aided to the stage but, once in place behind the lectern, he was wonderful speaker, full of passion, great humour and gave a very moving speech ending with thanks to the ‘happy band of crime writers’. 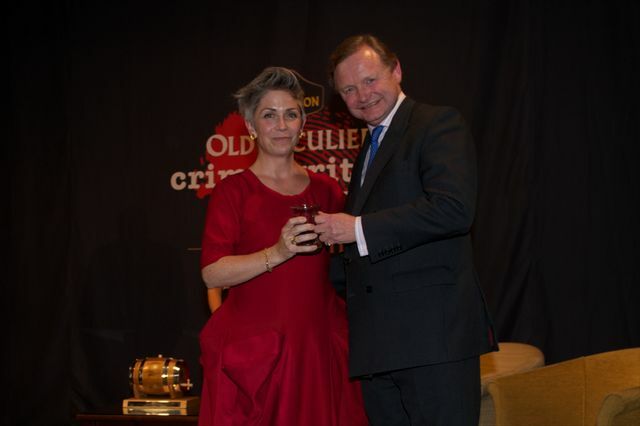 And then it was time for the announcement of the Crime Novel of the Year……which went to a very shocked (so shocked she couldn’t even swear) Denise Mina for The End of the Wasp Season. A great opening to a great weekend – following which many went to sample the ‘Crime of Passion’ and, although I didn’t do a headcount, I think we all made it through to the next morning….. 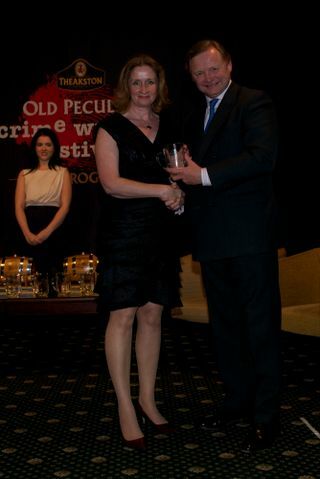 It was indeed a brilliant evening and it is great to see the photographs and remember it all again. I loved Colin Dexter. A brilliant and lovely man. I also loved Denise Mina’s style and am looking forward to reading her winning novel. An excellent opening to the festival. 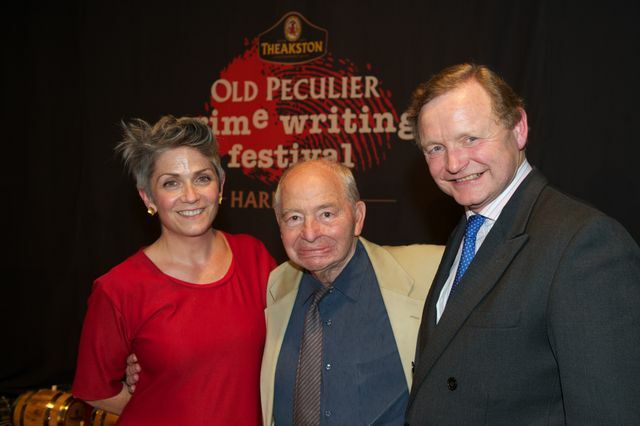 Colin Dexter did a talk in Church Stretton last night and I only found out when it was too late to get tickets. 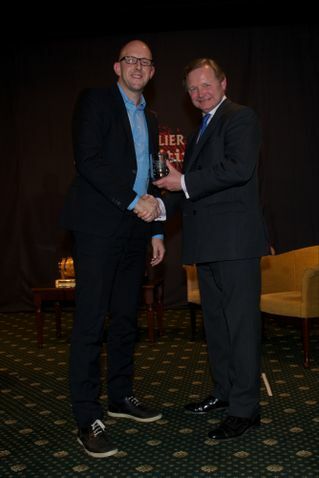 Pity, as from having heard his acceptance speech at Harrogate, I think it would have been an excellent talk!